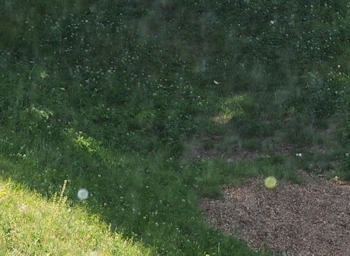 I've been trying to think of a good excuse for putting up this photo of orbs (right). But I don't think I need one! Many paranormal researchers now see orbs as not paranormal but that doesn't mean we should stop studying them. This is part of the general point I raised recently (here) concerning the xenonormal. Daylight orbs, like these, are rare. Most orbs are produced by flash in low light conditions. The light source here was, of course, the sun. So what is causing these orbs? 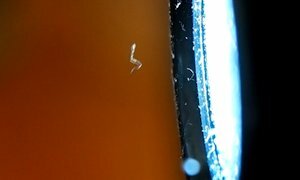 It turns out to be water droplets from a water sprinkler. Falling water, like rain, tends to produce tailed orbs, rather than the regular round ones (see here). So why don't these orbs have tails? I think it's because the camera is looking steeply downwards at the water droplets. Though the droplets are falling rapidly, that vertical motion isn't obviously visible from above, so no tail. So why is one of the orbs so obviously yellow? The objects that usually cause orbs, like dust or water droplets, are not colourful, so they get their colour from their light source. I think the white orb is being illuminated directly by the sun. The yellow orb, however, is in a shaded area and I think is getting its light reflected off surfaces around it and through the trees producing the shade. For a general explanation of orbs see here. For an extensive FAQ about them, see here. My acquaintance (MA) who has microsleep with REM (MWR) has experienced something new. MA was on public transport (regular readers will notice a pattern here) and experienced a typical short MWR. After briefly waking up again, MA then experienced a second short MWR. There is nothing unusual about that except for this - the dream 'plot' in the second MWR was a direct continuation of the first episode a few seconds before. It was the same scene, same 'characters' but the 'plot' had moved on to what you would expect following the earlier episode. It was, then, a continuation dream. MA can't recall details of the dreams but they were completely different to MA's surroundings. They are, therefore, unlikely to be a form of hypnagogia. Once the second dream sequence ended, MA remained awake, surprised by the experience, and there were no further episodes. A brief search of the web shows that a few people have had dream continuations before but usually only deliberately using lucid dream techniques. The very fact that there are so few references to this phenomenon suggests that it is a rare, particularly when happening spontaneously. It was definitely not a recurring dream, which is quite common, but a continuation of the previous one. How could a dream continue in this way? I suspect that the short gap, only seconds, between the two episodes is the key here. Dream recall is difficult because a dream is held in short term memory when we wake. That short term memory is quickly filled with new perceptual information as we see events around us. But suppose the dreamer resumes sleeping before the dream memory has been completely displaced from short term memory? The dream may still be 'loaded' in memory to be continued. This sort of thing that is only likely to happen to someone with MWR, who can start dreaming instantly on falling asleep, which would explain its rarity. Now suppose this experience happened to someone who experiences MWR but who is unaware of its natural cause. The bit in the middle, where the witness is temporarily back where they started, would actually serve to reinforce the idea that the dream experiences on either side were real. After all, dreams don't normally continue, do they? It could feel like the witness was being dragged between two alternate realities. It would be easy to see this as the effect of alien technology - being teleported between two different locations. Another possible interpretation might be a time slip. Every reported paranormal incident is different. However, most turn out, when investigated carefully, to be caused by one of a group of generic natural causes. If paranormal investigators were aware of these generic causes, it would greatly assist in eliminating natural explanations. And yet, I see obvious natural causes for apparent paranormal incidents overlooked routinely in accounts of investigations. Why is this? I think the problem occurs like this. If a natural explanation is found, investigators lose interest in the incident concerned because it isn't paranormal. This is understandable because people don't become investigators to look into stuff that isn't paranormal. However, this results in a major loss of valuable information about the natural causes for apparently paranormal incidents. So the next person who comes across a similar incident has to start all over again from scratch. It is, of course, the aim of xenonormal studies to explore natural explanations for apparently paranormal incidents. By collecting this information in a systematic way, and making it widely available, it becomes possible to check incidents for natural causes quickly and thoroughly. And eliminating natural causes is, of course, the central method of paranormal investigation. Consider anomalous photographs, as an example. It is possible to categorize photographic artefacts into distinct types, by technical cause: object out of focus (eg. orbs, vortexes), long exposure (eg. light trails, transparent objects, flying rods), reflection (eg. some ghostly figures, UFOs), low lighting, low resolution, image noise and so on (see here for an account of these types). When I examine an anomalous photograph I don't concentrate on the obvious anomaly and wonder what it is. Instead, I ask myself, what is wrong with this photo? And nearly every time there will be a fault from the list above! And in a very high number of cases, that will turn out to be the most likely cause of the anomaly. By studying the xenonormal scientifically, theories can be produced which can actually predict circumstances which will resemble the paranormal that have not even been reported yet! I have had this happen with anomalous photos. It is also possible, using such theories, to demonstrate to others how natural causes explain particular anomalous phenomena. For instance, though most serious researchers accept that orbs are not paranormal, many do not have a clear idea how they are formed. I recently realised that it should be possible to video a bit of dust becoming an orb directly, thanks to the Orb Zone Theory. If you manipulate the depth of field of a video camera, so that you can see the edge of the Orb Zone, you can see orbs turn into the bits of dust that cause them (see video here). For more on exploring the Orb Zone, including a commentary on the video and stuff not reported 'in the wild' yet, like 'popping orbs', see here. I don't expect investigators to give up the paranormal and go full time into xenonormal studies. But it would be helpful if they were to explore the natural explanations they find for anomalous incidents in more detail and share their results with everyone. 23 July: Face at a window vanishes! The ghostly face at a window is a particularly common form of anomalous photograph. But in all the cases I've personally examined, the photographer noticed no face at the window at the time of exposure. This leaves open the possibility that most, if not all, of these ghostly faces are actually photographic artefacts. I've certainly not come across one that didn't have a natural explanation - yet! 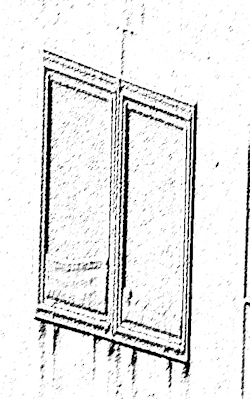 Cases of people actually seeing ghostly faces in windows are, in my experience, far rarer. So, I was taken by surprise recently when I noticed a shadowy face in a window which then vanished. It didn't turn or move away - it simply vanished out of existence! A ghost, then! I had no reason, at first, to doubt that the face wasn't that of a real person. It wasn't particularly distinct but, given that it was in shadow and apparently a little way back from the glass, that's what you'd expect for a real face. It was of a size and position where you'd expect to see a face at that particular window. Taken aback but continuing to watch, I then realised there was still 'something' in exactly the same position, but it wasn't a face. After changing my angle of view as much as I could, in several directions, I realised that the object was the reflection of a dark cloud. It had features that happened to resemble, in size and position, the mouth and eyes of a human face. It was, then, clearly a misperception. I think this incident probably illustrates why ghostly faces are not seen that frequently in windows by eye witnesses. There were a number of factors that had to come together to produce this misperception. Firstly, I, the witness, had to be at the correct angle to see the reflected cloud. If I'd been simply walking past the window, instead of standing still, I doubt I'd have noticed it. In a still photograph, of course, the viewer is always at the same angle to the window! Secondly, the cloud had to be dark and have features in the correct configuration to resemble a face. A bright cloud simply wouldn't have looked like a face. The fact that the room behind the window was also in shadow helped. A real person's face in that situation would have looked pretty much like the one I saw. The sky was overcast, which helped. Thirdly, the position of the 'face' was crucial. It corresponded to just where an average height person's face would be if they stood just behind the window, looking out. So, given that all those factors needed to come together, it makes sense that ghostly faces produced by reflection are not often reported. I have seen other window ghosts before - see here for instance. 22 July: The good old days! One of the perils of growing older is an increasing tendency to believe that things used to be better in the 'old days'. In most cases this belief is no more than pleasant nostalgia. But there are sometimes instances where one could make a case that the way things used to happen in the 'old days' was indeed better. Take ghost vigils. I looked up some contemporary practical hints for setting up ghost investigations on the web just now. It is certainly a lot different to how we used to do things in the early days of ASSAP. The websites I found all obviously assumed that ghosts are spirits, despite the lack of any compelling evidence to support this popular idea. Assumption-led methods, rather than evidence-led ones, are also now central to such investigations, if these websites are any guide. So how were things better in the old days? One highly important factor is prior research. We always tried to avoid participants knowing anything about what to expect before going on a particular ghost vigil. Thus, if they came up with the same phenomena that had been previously reported by independent witnesses, it tended to reinforce the reality of the haunting, however caused. Nowadays, it is virtually impossible to stop people researching a ghost vigil venue on the web before they arrive. There are lots of reports online and even entire TV programmes about some locations. The trouble is, if you are expecting the smell of violets in the Blue Room, it is only too easy to get that sensation there, purely from psychological suggestion. Vigil participants can also now easily research the history of a location before they go. Once again, if you know that a place was once used as a coaching inn, it becomes all too easy to 'hear' the sounds of horses's hooves, purely through expectation. We can't uninvent the internet, and nor would I want to, but it has effectively removed one important tool for controlling suggestion. So, I think that, in some respects, things were better definitely better in ghost vigils in the 'old days'. But, given that we can't go backwards in time, there are always other ways to improve current vigils to make therm more useful - see here for instance. Have you seen them on the coasts? These are the only two lines I still remember from a song I once wrote as a teenager. Like many young people, I listened to rock music and formed the misguided idea that I could compose and sing like my heroes. I even made tape recordings of this and many other songs. Mercifully, for me and everyone else, none of them survived. I only remember this gem because it was particularly daft. Even then I was fascinated by ghosts, though I knew little about them. I definitely had no special knowledge about a supposed preponderance of seaside apparitions. It just rhymed! Like most people, then and now, I thought ghosts were spirits. That was the way they were invariably portrayed in ghost stories. It took many years of research to discover that ghosts are many things but, curiously, there is no compelling evidence that they are spirits! I mention this because ASSAP is holding a conference on ghosts, Seriously Spooked, on 27 September. Ghosts have always been easily the most popular subject among ASSAP members. I suspect this may be because ghosts are so much more accessible than other spontaneous anomalies like UFOs, lake monsters, fish falls and so on. Unlike those other anomalies, ghosts tend to be repeatedly reported from a particular location. So, in theory, if you go to that site and wait long enough, you stand a chance of actually seeing one for yourself. In theory. But despite the huge number of ghost vigils in recent years, most of what we actually know about ghosts comes from the carefully collected accounts of case witnesses. And the picture that emerges is that the 'ghost' is actually a composite phenomenon. There are many different causes for different ghost sightings and even more for haunting experiences. A great many ghosts sightings are caused by misperception, near sleep experiences or coincidence. Of course, there are many who stick rigidly to the idea that ghosts are spirits, despite that lack of compelling supporting evidence for that idea. The influence of culture is strong! I learned, long ago, that searching for evidence to support this idea is largely a waste of time. Instead, I found it is better to take the scientific approach of looking at what evidence there actually IS and see where it points. There is certainly ample evidence to support the existence of ghosts and lots to suggest what they are. There just isn't much suggesting they are spirits. And I haven't found any evidence that they occur mainly by the sea. Tickets for Seriously Spooked will be on sale very soon! I was at the door where I see the door ghost (see here for background). However, I'd forgotten all about the ghost, my mind being on other matters. As usual, this meant that the ghost duly appeared. Being in a hurry and not in the mood, I moved my hand (which causes the misperceived ghostly figure) upwards out of view to deliberately break the slightly unsettling perception of someone just behind me. But to my astonishment, I saw the dark ghost walk away along the path behind me. Though I've had a similar experience before (here), this one was unexpected for two reasons. Firstly, it was bright and sunny. I had thought the ghost would not appear in such conditions. However, on the contrary, it appeared clearer and more distinct than ever. Secondly, I knew it was a misperception when I, quite deliberately, moved my hand. Despite that, the misperception persisted! In fact, it was so vivid that I was convinced, for all of a second or two, that there was a very solid real person right behind me. There wasn't, of course. So, I was in the weird position of (a) knowing I was misperceiving but (b) somehow also thinking that what I was seeing was real. I think (a) was a conscious thought while (b) was an unconscious feeling. I think it was the very act of moving my hand that made the misperception persist. The movement made the hand less easy to see, and so, easier to misperceive. What does this all this mean? Well, firstly bright scenes are not only no bar to misperception but might even make it more vivid. I had a hint that this might be the case in writing yesterday's blog entry. Secondly, it appears that even knowing you are misperceiving does not always break the misperception. It seems misperception can be more persistent than I'd always assumed. Thirdly, object movement may be another misperception trigger in itself. Most of the misperceptions I have personally noticed have been stationary. I had thought that moving apparition cases might only rarely caused by misperception. However, I am now revising that opinion. The very motion of an object can make it more difficult to see, provided the observer is not following it with their gaze. I didn't follow my hand in this particular case, making it appear blurred. 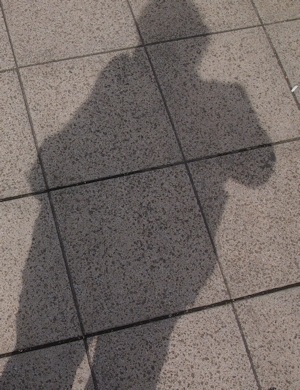 Misperception may be an important cause of moving apparition cases after all. Somehow I don't expect to see a ghost on a bright sunny day. But why not? When I noticed someone on a familiar local bench recently, I was curious to see who it was. The person was lying down, presumably sun bathing. I certainly wasn't expecting a ghost! I was a little shocked, once I got a better view, to see that the figure on the bench had vanished, to be replaced by a bunch of brightly coloured plastic bags. So, a ghost then! On a bright sunny summer's day! It was, clearly, a misperception. The bags were of a size and position where they suggested, to the casual observer, a person lying on the bench. I, as that observer, actually saw them as a very real person, not a mere suggestion. Though I couldn't see a face, I clearly observed bright green shorts and a white top of some kind. Given the position of the 'person,' and some bushes between me and the bench, I wouldn't have seen a face even if there had been one present. And that is what made the misperception work - everything was in the right place and in the right proportions to be a real person. And so a real person is precisely what I saw, albeit one generated by my visual memory. What continues to amaze me about misperception is how something quite minor, like the chance arrangement of some plastic bags, can produce a big response in the brain of an observer. The bags literally became a recumbent human figure. I saw no bags whatsoever, initially at least. In the past, I could not quite see how someone might mistake a tree stump for a real human figure, complete with clothes and facial features, or spot 'port holes' on what was clearly the planet Venus. Visual substitution provides the mechanism for this apparently astonishing transformation. It seems that our brains like to make sense of what we see so much that they sometimes let us 'see' things that are not physically present, often in surprising detail. I am no longer surprised by the level of detail in reports that were clearly generated by misperception. It is not a case of faulty memory or exaggeration - the witness really did see exactly what they reported. It's just that what they saw wasn't actually physically present at the time. I now see such misperceptions so frequently that they only occasionally shock me, when I see a really dramatic example, like the bags on the bench. It would be easy to see how someone else who notices misperceptions as I do might consider themselves psychic. And please don't assume that someone who sees port holes on Venus needs an eye test! Anyone travelling on public transport these days is likely to be familiar with automated pre-recorded announcements. But when my acquaintance (MA) who gets MWR (microsleep with REM) episodes heard one recently it was astonishing because it related directly to what was going on in the train at the time. But how could that be? MA quickly realised it was an MWR episode. Specifically, MA experienced a short hypnagogic episode which mixed elements of a dream with real scenery and sound. And the most striking part was an announcement that had been changed to suit the 'plot' of the dream. The voice of the announcement sounded the same as usual, but some of the words had been changed to similar sounding ones more relevant to the 'plot' of the dream. Of course, the real announcement could not have changed as it was pre-recorded. Such hypnagogic episodes are the cause of many apparently anomalous experiences, so it is important that we know how they work. If we know the specific ways hypnagogic experiences are realised, they can become more easily recognisable in anomalous accounts. In many hypnagogic episodes, additional elements, like human figures, are 'added' to real scenes where they might be interpreted by the witness as ghosts or aliens, for instance, depending on the context. This latest example is interesting because it involves the subtle 'editing' of real sounds rather than the addition of completely new elements. Of course, it is possible that the announcement itself was an 'addition' rather than an 'edit'. However, the announcement did not obviously form part of the 'plot' of MA's hypnagogic experience. The fact that it was 'adapted' to fit in with the 'plot' strongly suggests that it was real sound intruding into the experience. It is possible that this happens more generally when unexpected visual or sonic elements intrude into such an experience. They are too intrusive to be ignored so they are edited to fit the plot of the hypnagogic episode. I looked around, startled, trying to find the source of the loud strange noise. I soon found it! It seems I had inadvertently disturbed an electronic device. I switched it off. I was near an open window and realised that the sound must have been easily audible outside in the street. Sure enough, a passer-by stopped and looked around enquiringly. I am 99% sure the man had heard the odd noise and was trying to locate its source. I only found the source because it was near me and I was the one who had set it off. The man in the street stood absolutely no chance of correctly identifying where the sound originated. The incident made me realise how easy it is to be wrong about the source of a noise. 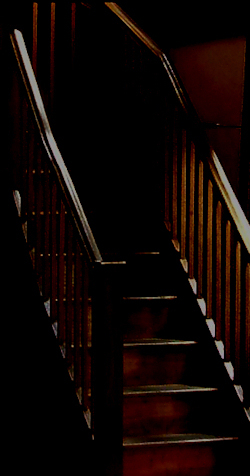 Odd noises are the most commonly reported symptoms of hauntings. And once a noise is misidentified, later witnesses will be biassed towards hearing the same noise wrongly. I remember a haunting I investigated where a sound of whispering was reported at a particular location. So I was incredibly excited when I, too, heard the ghostly whispering at the same place. However, after a while I realised it was actually the sound of water flowing through a pipe! If no one had ever reported it as whispering I think I would have identified it correctly straight away. And I'm sure other people going to the same location probably still hear 'ghostly whispering' to this day! Walking through a wood recently, as you do, something caught my attention. I couldn't see it very well in the gloomy lighting conditions but I was sure it was something interesting. In fact, I was sure it was a living creature of some sort but I wasn't sure what. So, I took a photo of it (right). 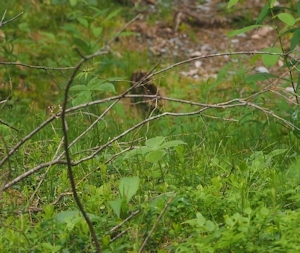 When I examined the photo later, it looked like an owl, standing on the ground. I also took a second, zoomed, photo of the object at the same time, experience having taught me that this is a very useful thing to do. Owls are always tricky to see, even for experienced birders. 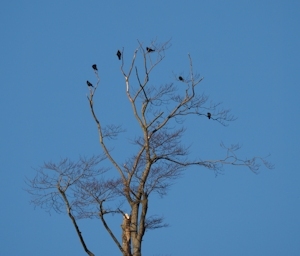 It isn't just their generally nocturnal habits, they are also surprisingly unobtrusive for a large bird. I was disappointed, when I later examined the zoomed shot, to see that the 'owl' was, in fact, a small tree stump (see photo below right ). Once I got over my disappointment I realised there was, after all, something rather interesting about this 'owl' observation. I only ever saw the object as an owl in the first photo, not in my simultaneous naked eye view of it. Now the vast majority of photographic anomalies are only seen after the event, in the photo itself. I have often thought that if the observer was able somehow to go back in time and examine the scene again carefully with their naked eye, they would NOT see any anomaly there. This 'owl' observation tends to support that idea. So why did the object only appear as an owl in the first photo? The stump is certainly the right approximate shape, size, colour and pattern for a Tawny Owl. There is even a suggestion of a 'facial disk' and a dark 'eye', on the left side of the 'head' exactly where you would expect one, in the upper photo. And yet, I saw no 'owl' at the time with the naked eye. Why not? A crucial point, I believe, is that the 'owl' in upper photo is out of focus. In contrast , it is IN focus in the lower photo and would have been to the naked eye too. In fact, we almost never see anything out of focus with the naked eye because our eyes are constantly changing focus as we look around any scene. So the 'owl' has come about because of a difference between the way the naked eye and a camera works. 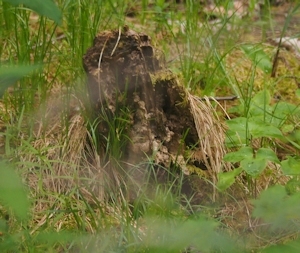 If I look at the stump with my naked eye, I automatically focus on it, and see no owl. However, the camera has focussed on the vegetation in front of the 'owl', so putting the background out of focus. It is, thus, an example of a photographic artefact, like so many anomalous photos. And that, I think, is why so many photographic anomalies are only seen on the photo itself, not by witnesses at the time of exposure. Last month's (June) website figures are an average of 14245 hits per day. This is considerably up on the previous month's 12098 daily average.